Looking for a Used EX35 in your area? CarGurus has 375 nationwide EX35 listings starting at $3,900. Making a very quick journey from auto-show concept to full production vehicle, the 2008 Infiniti EX35 will debut in late 2007 after a showing at the spring New York Auto Show. Sharing the same FM platform with Infiniti's G and FX vehicles, but falling somewhere in between in terms of size, the 2008 EX35 is a compact crossover. 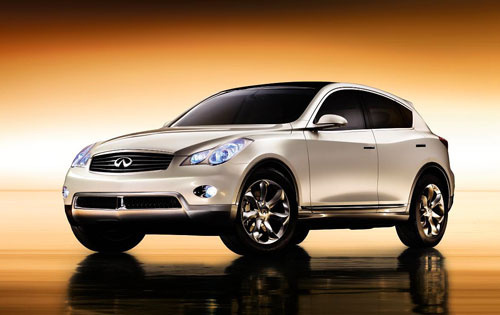 Infiniti says its stylish sporty profile blends a streamlined coupe with the height and versatility of a small SUV. Indeed, the sloping rear roofline, long hood, short overhangs, chrome trim, and hatch-lid spoiler seem to confirm this statement. A nice feature is the Scratch Shield paint, which uses everyday heat to spread its resin to "fix" scratches. The likely powertrain will be a 3.5-liter V6 that gets 297 hp and 253 ft-lbs of torque, matched to a 5-speed shiftable automatic with sport mode. Both rear-wheel and all-wheel drive will be available, though it is unlikely it will be an off-road vehicle with less than six inches of ground clearance. A full set of luxury features will adorn the interior, including power front seats, leather upholstery, and a navigation system. Sporty touches will probably be carried through to the inside in the form of high-contrast instrument panels and alloy accents. Two trims will be offered - the EX35 Base and the Journey. The latter will offer the convenient power-folding second row. Equipped with ABS brakes, traction control, and dual front-side and side impact airbags, the Infiniti will likely rate highly in crash tests. The biggest news will be two technological innovations. The 2008 EX35 will be the first North American vehicle to offer an Around View Monitor (AVM). Consisting of a front, rear, and two side cameras, it will give a bird's-eye view around the car to help reduce blind spots and complement the standard backup sensors. The Lane Departure Prevention system exists in only one other Infiniti vehicle. Supplementing the lane-warning system, the LDP uses the Vehicle Dynamic Control to adjust braking when it senses the car drifting into another lane. Early reviews of the 2008 EX35 praise its smooth, refined, and subtle styling, which resembles an enlarged sports coupe. The power and handling should be adequate, and the added technology will probably be a welcome addition to harried drivers carting kids around. It is also priced less than its competitors from BMW and Acura. The biggest complaint will likely center around its small cabin and cargo area. Although it claims to be an SUV, the EX35's cargo area holds just under 17 cubic feet, and rear passenger legroom is a tortuous 28 inches. What's your take on the 2008 INFINITI EX35? TheHorror There are size limits on SUVs? Hardly -- a Daihatsu Rocky qualifies as one. As the author is obviously confused as to what constitutes a SUV, it's not surprising that he or she is mistaken to assert that the EX is one. Have you driven a 2008 INFINITI EX35? My battery died. And my drivers door handle doesn’t work....so I can’t use the physical key to open the door. How can I get into the car....or open the hood? I captured my EX35 tire from inside. Is it 4wd??? How To Know If Infiniti Ex35 2008 Is All Wheel Drive?